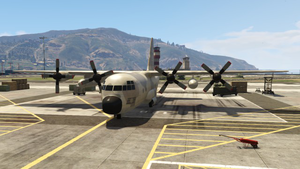 A Titan in Grand Theft Auto V.
The Titan is an airplane in Grand Theft Auto V that is said to be able to hold up to ten passengers. and is based on the C-130 Hercules. A Titan in the GTA Online trailer. This page was last modified on 26 December 2013, at 18:00.